Born on Christmas Day 1913, A. N. L. ‘Tim’ Munby studied at King’s College (1932-1935) before working in the antiquarian book trade with Quaritch and Sotheby’s. Having spent most of the War as a prisoner in Germany, Munby returned to Cambridge as Librarian at King’s in 1947, where he remained for the next 27 years. The earliest donations of books appear to have been made in that first year, including two incunabula. The first two incunables from Munby came to the library in 1947. Bound together in a small volume, the two books include devotional treatises traditionally, but spuriously, attributed to Bernardus Claravallensis. They were both printed in Paris by Pierre Levet about 1495. The first (Inc.6.D.1.16, item 1) is a collection of religious treatises including the Meditationes de interiori homine, also attributed to Hugo de Sancto Victore, De gubernatione rei familiaris by Bernardus Silvestris, De ordine vitae attributed to Johannes Homo Dei and De conscientia ascribed to an anonymous Cistercian of the 12th century (ISTC ib00407500; Oates 2988). The second (Inc.6.D.1.16, item 2) is the Modus bene vivendi in christianam religionem by Thomas de Frigido Monte (c. 1150-1225), a French Cistercian monk (ISTC ib00415000; Oates 2989). It is the only copy in the UK of Levet’s edition, which was the fifth among the nine editions of the text published in Italy and France between 1490 and 1500. Red initials of simple design were supplied in the late fifteenth or early sixteenth century, together with underlining of captions and highlighting of printed capitals and paragraph marks in red. The volume still retains an early sixteenth-century parchment cover over wooden boards. Unfortunately, there are no signs of ownership or contemporary annotations and therefore no hint about the identity and location of the original owner. Nevertheless, the round spine and coloured endbands laced through the boards may suggest an English or Irish provenance alongside the printed label pasted on the upper pastedown by the Dublin booksellers Grant and Bolton sometime in the nineteenth century. The volume belonged to John Trower (1844?-1898) of Exeter College Oxford before entering Munby’s collection (it carries his simple book label). The third incunable is a rare copy of an oration to Pope Alexander VI (Pope 1492-1503) by an obscure doctor of theology, Marcantonio da Frascarolo (Inc.5.B.2.38). The Oratio ad Alexandrum VI in Adventu Domini a. 1498 habita was recited by the author in front of the Pope on Christmas Day in 1498 and was given to the printer shortly afterwards, as explained by the editor Michele Ferno (1465-1513), lawyer and man of letters, in his preliminary letter dedicated to Nicolò Lippomano (d. 1516), Bishop of Brescia. The edition, attributed by bibliographers to Johannes Besicken in Rome (ISTC it00375000; Oates 1599), is therefore datable to 1499 or 1500 (see Martin C. Davies, “Besicken and Guillery”, in The Italian book 1465-1800, Studies presented to Dennis E. Rhodes on his 70th birthday, edited by Denis V. Reidy, London, 1993, 35-54 – p. 53 n. 27). This is the only edition of the text and survives in eight copies, including the present one. This slim booklet was bought by Munby for the library at the sale of Sir Robert Leicester Harmsworth of Morey Lodge, Campden Hill (Sotheby’s, 15-17 March 1948, lot 4494). Munby gave his next incunable to the library on 22 November 1948 (Inc.3.B.3.152). The book is a beautifully unspoiled copy of Suetonius’s Vitae XII Caesarum. Published in 1480 in Venice by an anonymous printer identified as Johannes Rubeus Vercellensis (ISTC is00820000; Oates 2224), it is the earliest printed book donated to the library by Munby. 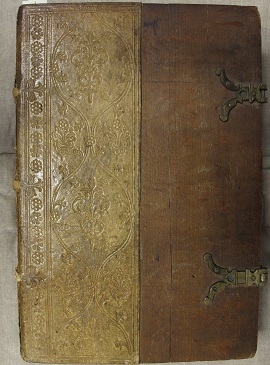 The quarter binding – of brown goatskin with blind-tooled decoration over beech-wood boards, with a stub of red-stained alum-tawed leather for the missing fastening clasp at the fore-edge of the upper board, and a decorated rhomboidal-shaped brass catch at fore-edge of the lower board – is untouched and remains in very good condition. The book includes a few marginal manuscript notes in a late fifteenth-century humanistic cursive hand, the ownership note “P. Matthei Fasennis [? ]” on leaf a2 recto, and a late nineteenth- or early twentieth-century note in Italian on leaf b6 verso about the completeness of the text despite the cancellation of faulty leaves b7 and b8, which contained misplaced duplicate text. The volume was bought in Italy by Thomas Ashby (1874-1931), archaeologist and director of the British School at Rome, and bears his book label with crest and motto “In unitate robur” on upper pastedown. It left Italian soil for the first time when brought to England in 1930, following Ashby’s appointment to a senior research studentship at Christ Church, Oxford. The fifth and last of Munby’s incunables (Inc.4.D.2.17) (purchased by the Library from Munby in 1950 rather than a donation) is a copy of the only edition of the Sermones floridi de tempore by the Dominican friar Leonardus de Utino (c. 1400- c. 1470), edited by Jodocus Badius Ascensius (1462-1535) and published in Lyons by Johannes Trechsel on 15 July 1496 (ISTC il00142000; Oates 3217.5). The book is not rare, but interesting for its early binding and provenance. Its quarter blind-tooled pigskin cover over beech-wood boards is in typical German style, with brass clasps anchored to the fore-edge of the lower board and brass catches at the fore-edge of the upper board. It is indeed attributable to the bindery of the Dominican Cloister at Wimpfen am Neckar in Baden-Württemberg, active between circa 1470 and 1550. Moreover, the book bears notes relating to its acquisition in 1500 in “meding” [probably the Dominican nunnery of Medingen near Dillingen] by the Dominican friar and confessor Johannes Lenglin (active 1484-1515) of the Dominican Cloister of Frankfurt am Main, who added the coloured initials and rubrication, and a number of marginal notes and comments both in Latin and in German. Discharged as a duplicate by the Stadtbibliothek of Frankfurt, the volume bears the stamp of Gerschel’s [Oskar] Antiquariat in Stuttgart. 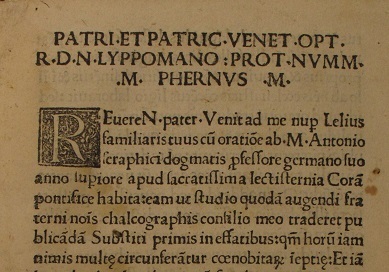 Incunabula were not the only early and rare printed books donated to the library by Munby. About fifty titles given by Munby were discovered early this year among the library eighteenth-century books, as described in Tim Munby’s donations to Cambridge University Library posted in the Special Collection Blog. They include a guide to learning Italian (Amsterdam: 1709), donated in October 1949. Compiled by Giovanni Veneroni, Italian interpreter to Louis XIV, Le maître italien (7760.e.20) is particularly interesting because it came from John Nicholson’s circulating library in Cambridge. Similar searches of the seventeenth- and nineteenth-century holdings have yet to be completed, but will certainly reserve more surprises. Considering Munby’s donations as a whole, the vast majority do not carry his personal bookplate or book-label (present in virtually all of the bibliographical works bought by the Library after his death), which suggests that they were not from his own library but that they were purchased with the intention of being donated to the University Library. It is noticeable that three of the incunabula and many of the eighteenth-century books are very rare, some surviving in only a handful of copies. So, not only was Munby acquiring books the Library did not already have, but he also sought out editions which were especially rare and desirable. Alongside the Munby collection purchased by the Library in 1975, and the Fellowship established in his memory, his donations stand as a fitting memorial to the generosity of a giant among Cambridge bibliographers. ← A sixteenth-century Cambridge provenance for a Belgian incunable?